Why have the middle class become net receivers of welfare during this recession? ...after all, they were net payers in 1982. Figure 1. Mankiw discusses the economy. "...the middle class, having long been a net contributor to the funding of government, is now a net recipient of government largess." He notes that "part of this change" is due to the recent recession, but tries to imply that the government largess has been especially large this time around, since we did not see the same thing happen for the 1982 recession. So here is the answer to our question. The fact that the trough during the current recession (blue) is lower than the trough of the 1982 recession (red), as shown in Figure 2, demonstrates that the percentage loss in real GDP was worse this time around. 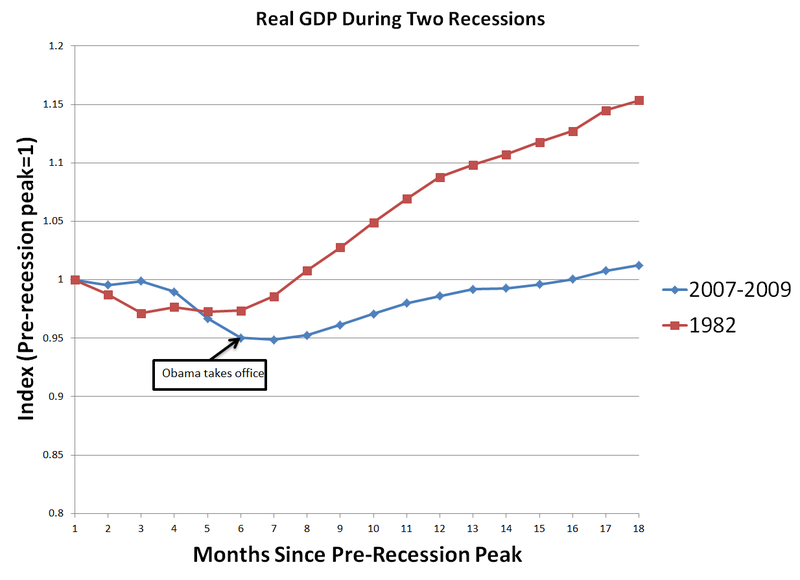 I've added a note indicating the quarter in which Obama was inaugurated--after the economy hit the bottom--just for reference. This partially explains the difference--the initial shock was worse this time around, with the economy shedding roughly 2% to 3% more of GDP than in 1982. 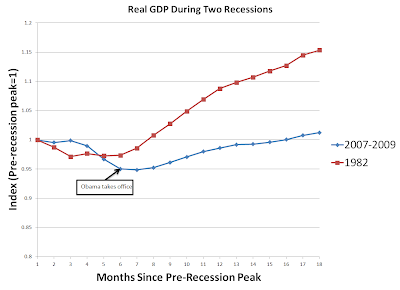 That does not, however, explain why the recovery has been so much slower this time than in 1982. Figure 3. Newly unemployed (blue) and long-term unemployed (red). We can see that actually the number of newly unemployed people remained slightly lower during this recession than in 1982, despite the fact that the overall labor force is larger now than it was then. Moreover, the pace at which the number of long term unemployed is falling is roughly similar this time to what it was in 1982 (it is actually a faster pace of recovery than 1990 or 2001). And therein lies the main difference between this recession and 1982--the rise in unemployment this time was mostly long-term unemployment, which means that the families of the unemployed are getting a lot more of their annual income in the form of unemployment benefits than in 1982, since the unemployed are a lot more likely to have been unemployed for a long time. Now just why is long term unemployment up compared to 1982? I do not have a theory at the moment. It would be tempting to blame Obama's extensions of unemployment benefits, but research has shown that this is not so: extending benefits could only account for at most an increase of 0.8% in the unemployment rate (thats about 1,200 thousand people, for comparison to Figure 3), not nearly enough to allow that rise in the long-term unemployed. Government revenue as a percent of GDP is often used as a proxy measure for the level of taxes--this measure fell from 19.5% in 1982 to 16% during the current recession, the lowest it has been since the 1950s. But this measure understates how low taxes are these days, since the denominator, GDP, also fell during the recession even as we cut taxes. The marginal tax rate for the median income has fallen from 28% in 1982 to 15% during the recession. Don't forget that the original stimulus act was a sizable tax cut passed by Bush in early 2008, and that around 40% of the $800 billion in Obama's 2009 stimulus act was also more tax cuts.